FoxFire 1.0 for Mac, as its named implied is the screen saver for Mac OS X system that displays a dancing light with an optional clock when the computer is staying idle over a period of stipulated time. As defined in dictionary where fox.fire is a noun which means a phosphorescent glow, especially that produced by certain fungi found on rotting wood. The screensaver has the same effect, but the colors are customizable. 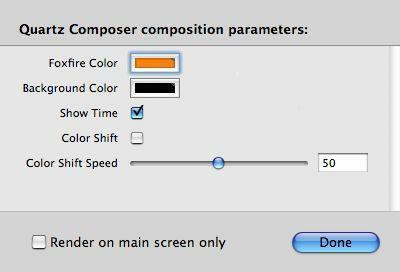 Screenshot of FoxFire 1.0 in Mac OS X.
Quartz Composer composition parameter for customization. Mac OS X 10.4 or higher required for FoxFire. 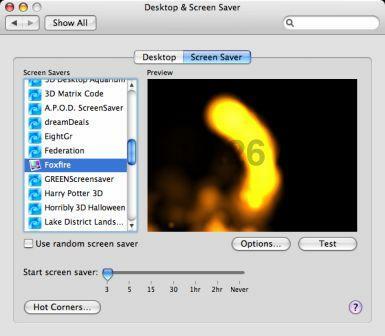 As the screensaver is made with Apple’s Quartz Composer application, the screensaver has to be manually installed by copying over to screensaver folder.